Courtesy of Phil White, Memphremagog Winter Swim Festival, Vermont. The average age of the participant in the 2017 Memphremagog Winter Swim Festival in Newport, Vermont is 47.3 years. They will be swimming 25m, 50m, 100m, and 200m events in a 25-meter, two-lane pool cut in the ice by the EastSide Restaurant on Lake Memphremagog. 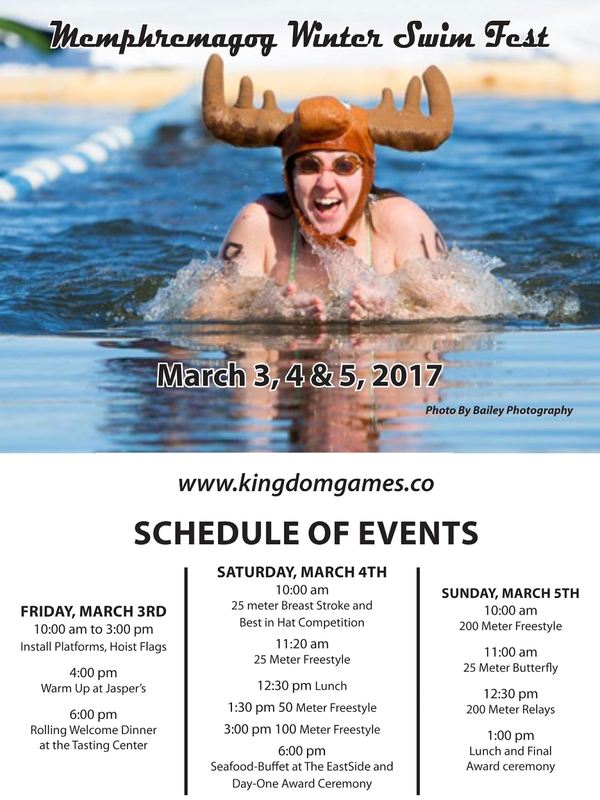 The event is hosted by Kingdom Games and The Eastside Restaurant and is underwritten by Eden Ice Cider, the NEK Tasting Center, and the Ciderhouse Bar & Grill. For more information, visit www.kingdomgames.co or email phw1948@gmail.com. Daina Bouquin (27), Janet Manning (53), Jerome Leslie (38), Scott Zornig (57), Kellie Latimer (31, shown above in the Best in Hat competition), Tiffany McQueen (44), Greg O'Connor (47), John Gale (61), Kristie DeMarco (46), Ed Gabriels (55), Elaine Howley (39), Anne McLindon (50), Paula Yankauskas (62), Sam Young (27), Anders Jakobsson (49), Hugh Darlington (60), Louise Hyder-Darlington (56), Caroline Block (32), Robert Bailey (50), Mary Staples (34), Ted Hirsch (56), Gregory Gomez (58), Rebecca Perry (48), David Bosch (50), and Edward Riley (58).